Disclosure: I received free samples of California Avocado mentioned in the post. 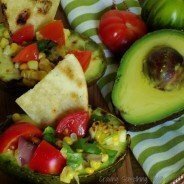 By posting this recipe I am entering a recipe contest sponsored by California Avocado and am eligible to win prizes associated with the contest. I was not compensated for my time. It also has 20% of the daily value for vitamin B-6, and 24% of vitamin C! Can you say SuperFood?! In addition to their health benefits, avocados are so versatile. A few slices make a nice addition to an omelet for brunch, and of course, they’re great as a snack or appetizer with chips and salsa. I think avocados look so pretty when served as part of a salad, and just cut in half. They make a beautiful addition to any summer cookout table, and that’s perfect because they’re in season from spring until the end of summer. When I saw that the California Avocado Commission was sponsoring a Recipe Redux recipe contest, I jumped at the chance to share one of my favorite summer salads. I love this grilled avocado salad because it’s a show stopper – so colorful and beautiful. Most of the ingredients are grilled ahead of time, so it’s also easy, and everyone gets their own individual portion – kinda fancy :)! Vegetables can be grilled and salad assembled several hours before serving. 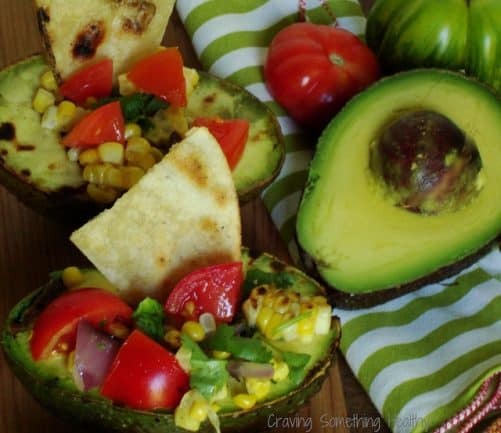 If holding grilled avocados, brush with a little extra lime juice, and put halves together to prevent browning. Stuff avocados just before serving. Spray tortilla with cooking spray, or lightly brush with olive oil. Sprinkle lightly with salt. Squeeze lime juice from 1/2 lime (about 2 Tbs) over avocado halves. Brush avocado, onion slices, and corn with half of the olive oil. Lightly salt avocado halves. Grill vegetables and tortilla until slightly charred and softened. Avocado halves should be grilled flesh side down, and will only need 1-2 minutes until charred. Remove vegetables and tortilla from grill and let cool. When cool enough to handle, cut kernels from corn and place in a mixing bowl. Cut onion into diced size pieces and add to bowl. Add diced tomato, black beans, cilantro and jalapeño (if desired). In a separate bowl or measuring cup, mix remaining 2 Tbs lime juice, 2 Tbs olive oil, cumin and salt to taste. Mix well, and pour dressing over salad and toss again. To serve, put 1-2 spoonfuls of salad mixture in and around each avocado half. Garnish with a tortilla chip. 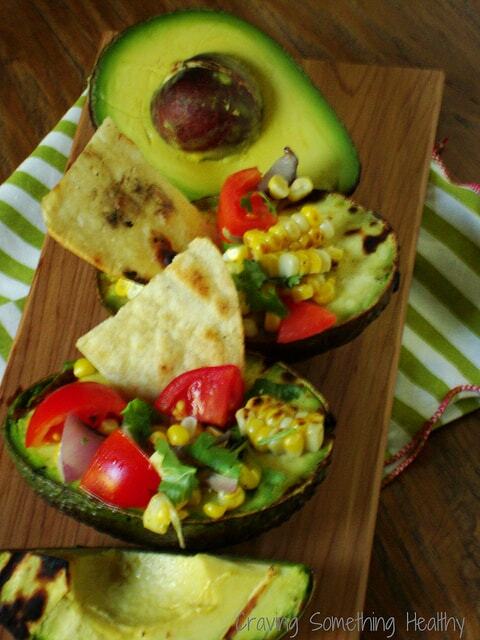 I’ve seen grilled avocado, but never w grilled corn and tortillas. What a perfect pairing!